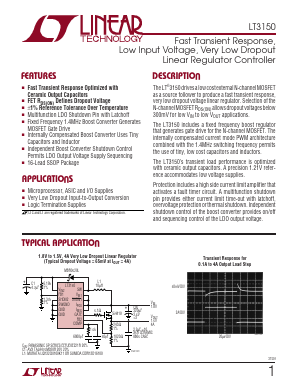 The LT®3150 drives a low cost external N-channel MOSFET as a source follower to produce a fast transient response, very low dropout voltage linear regulator. Selection of the N-channel MOSFET RDS(ON)allows dropout voltages below 300mV for low VIN to low VOUT applications. AP7365-08 600mA, Low Quiescent Current, Fast Transient Low Dropout Linear Regulator View Diodes Incorporated.